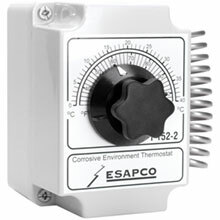 2-Stage, 2-Speed Thermostat, perfect for 2-speed applications. � Designed for use with 2-speed fans and Corrosive Environment. � Can be used to automatically open motorized louvers before turning on an exhaust fan. � Stainless steel spiral bulk sensor, with a 40�-100�F (5�F-40�C) set temperature range. � Differential: 6�F between stages, on/off 5�F minimum. � NEMA 4X watertight enclosure. 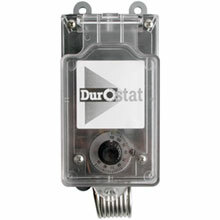 Pre-wired thermostat assures accurate soil and temperature control. � Ideal for controlling soil heat cables. � Waterproof enclosure with 8' power cord and 5' temperature sensor. Clear, waterproof flip cover keeps dial clean and easy to read! � No-nonsense, affordable, dependable temperature control. � Controls heating or cooling from 30�F to 110�F. � Stainless steel coil for accuracy. � Dual Voltage: 16FLA @ 120V, 8FLA @ 240V. � Liquid filled stainless steel sensor. � Turns equipment on at approximately 2 degrees above set point and off 2 degrees below. Product Note: The CR2095 must be wired directly, no plug included. Wiring instructions located on white sticker inside of gray box. USE THERMOSTATS FOR FINE TUNING TEMPERATURE OF SEEDLING HEAT MATS AND PROPAGATING PROCESSES! Copyright 2007, All Rights Reserved Including Page and Website "Look & Feel"